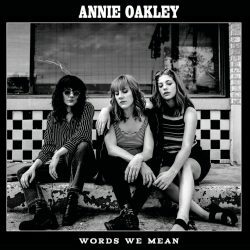 Annie Oakley are a three-piece acoustic trio from Oklahoma City and ‘Words We Mean’ is the group’s first full length album and the culmination of many years of writing and playing together – the chemistry between them evident throughout. The story of the formation of the group is bittersweet as twin sisters, Sophia and Grace Babb, began writing songs at aged 14 following the death of their father and soon after they were joined by a friend named Nia on violin who was also dealing with the loss of her own father. Consequently, the trio went about writing songs as a form of catharsis, and this exploration of their feelings led to Annie Oakley being born. ‘Words We Mean’ is entirely guitar driven with just the three girls playing and singing. This pushes the vocals and lyrical content to the forefront, and whilst they aren’t breaking the mould in terms of the overall sound of the record, with a deeper dive into the construction of the songs and in particular, the lyrics, it’s obvious the trio have captured a certain magic that sets them apart from their contemporaries. Utilising their three voices, the tracks have layered three part harmonies that intertwine with each other perfectly, each unique voice contributing to the texture, creating an ethereal and captivating sound, which gives a real lift to the choruses in the songs. The most prominent examples and some of the best use of harmonies is in tracks such as ‘Recognition’ and ‘Nothing To Say,’ however, the record is never short of fantastic vocal performances and excellently crafted harmonies. Musically, the guitar playing is relatively simple when compared to the vocal complexities, accented by violin parts however, this works well within the context of the group and whether intentional or not, provides an excellent bed for the vocals and lyrics to sit on top of as the main attraction. The lyrics throughout are clearly incredibly personal to the group to the point where each track is almost anecdotal, written to reflect an exact place or point in time or a person that they knew. All the while this never detracts from the relatability of the songs’ content as the emotions described are incredibly human, exploring themes of everyday life and some lyrical highlights on the record are ‘Brother’ – about someone that has seemingly lost their way – ‘If I Were A Ghost,’ touching upon death and the grieving process,and ‘Into The Light,’ a mildly distorted, electrical guitar track about young love. Overall, as previously mentioned, the group aren’t breaking the mould with their musical style and while at times the sound can seem overly familiar, with a bit more time and investment into the construction of the harmonies, the depth of the lyrics and the overall approach to songwriting, it’s clear that the chemistry between the members of Annie Oakley is part of the formula for something very special indeed and which cannot simply be called in nor imitated. A fantastic debut from a promising young group.